Some days, I see the headlines in the Express, and I despair. No matter how hard I work at writing fantasies, I will always be outclassed by the fantasies these people come up with daily. There was a recent story about an English council and one in Northern France doing cultural exchange visits and other cooperative council-y things. Nothing too unusual or particularly interesting about that but the Daily Express - who else - claimed that this was a barmy EU plot to merge Britain and France! However, I cannot see any reference in the above article about France being scrapped. Or have we merged already and nobody has noticed? Or can the Daily Express not keep track of their lies? 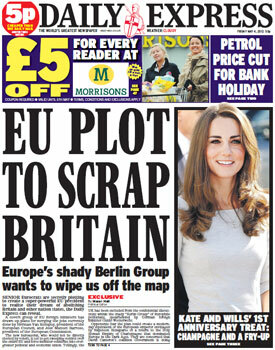 I'm beginning to think the Express is explicitly taking the p*ss out of its readers. They must be laughing their heads off. They'll believe anything!